3D printer improvements: Contributing to projects hosted on github: a step by step howto, and an illustration with Marlin (3D printer firmware). This short introduction may be a good start, i.e. using git as a solo developer without a "mother" project that you have no right on it. But we want here to contribute to someone else's project. So the deal is that git requires you to make yourself a full copy of the project, both remotely and locally. Then you work locally, you commit locally, then again remotely, and then tell the project maintainer that your copy has a change that may be interesting to them. Powerful, but convoluted for sure as it also means you need to get the changes from their own project that also moves on in between. Anyway git and github are painful enough for me to record the full procedure here, and hopefully once for all. It may help some old school developers as me, and may be it would let them contribute more easily to open source projects hosted on github. If this post is TL;DR, you may like this small and raw graphical resume instead. 2) Then go to the github repository you want to work with. You will see that there are tons of secondary variants made by tons of people so make sure you are working on the "right" one. Now, this is really annoying to me when your goal as here is just to try to submit a piece of code to the "original" authors. And no, you have to create your own repository first! This just due to the way github works: as a matter of fact we have to create yet another version of Marlin! 3) Now, still in the web page, click and fork the official Marlin repository (it will create copy in your account... and add to the mess for newcomers!). 4) Make sure to rename this copy to a meaningful name. Be it for you or for others, it will prove very valuable! Just click on the tiny almost hidden "project settings" icon in the bottom right margin (see below), then rename your project. Now get back to your main project page by clicking on the name of the repository, then copy the content of the small box in the bottom right margin, labeled "HTTPS clone URL". This is your repository URL, its ID card in a way. 5) Now back to the console! Of course you want to specify your own repository, not the one you forked from. Also, make sure you are using https and not http or will will make your life harder later on. Now the funniest part: start coding and hacking your stuff around... Oh you did already, didn't you? And you though about committing your changes to git afterwards, right? Now, it is time to submit your changes, and here it becomes annoying again. When you are done and want to save/store/submit/commit your changes, you have different commands to issue (no way it will never be as dead simple as a dumb cvs commit!). In fact you may merge the add + commit commands by typing git commit -a instead. As you seen it asked for a message related to the changes. Better write something useful because it will show in the history, and it helps you reverting to an older revision of the project when you screw it all, and it helps anyway to understand what you did months ago! 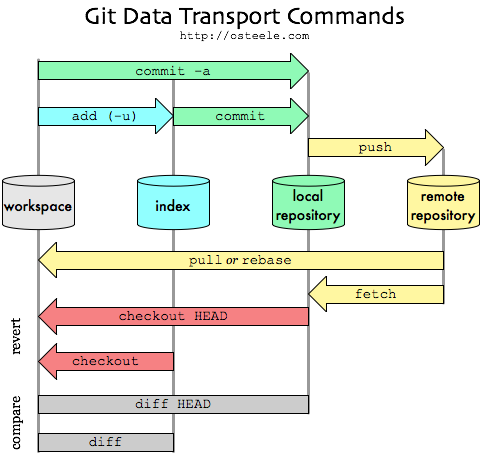 git push -- At last, send it to your repository! Hooray? oh no, not at all! Writing objects: 100% (6/6), 1.22 KiB | 0 bytes/s, done. At least it worked! My remote repository on github is now updated with my local changes. But how do I get the remote changes from the original repository, and further, how do I tell them I added a feature to Marlin? As we have seen, git push asks for your credentials (login and password). And it is more likely we will be making changes and submitting them more than once. To avoid having to type it all the time, you may check the many options given in this post. If you are using a desktop PC and use an encrypted user directory, then you may take the risk to store your password in your ~/.netrc special file (I have no clue on windows, sorry there!). But you would better go the safe way and upload your public SSH keys to github. This way it stops asking and you stay "fully" secure. There you can add your own "*.pub" SSH key. Check this help if you need more about SSH keys, or if you want github to generate some for you because you do not have some already (this is not recommended imho). Then, check you are OK when ssh -T git@github.com no more asks for your login. Did I say git was just plain painful to set for newcomers? Well, at least you can first commit your existing changes in the "htpps style" by providing your login to the git push, then delete the local project and re-clone the project as just above. But... this only gets the changes from your own repository, and not from the initial upstream repository. As usual git does not make it easy. Unless it is a one-time help you are giving to a project and you are OK to redo all the mess above months later, syncing with upstream is quite important. Otherwise and with time, your project will drift away from the "official" build to the point it will be much harder to get and merge the changes while dealing with increasing discrepancies and even conflicts. Submitting patches to the original authors will be even more difficult. You first need to tell that your version should also look for changes from within the original project you forked from (the upstream). OK let us try to finalize our stuff so that it will also get the changes from the upstream. Branches? Only monkeys need branches! Or... a typical hellish source code sharing system! From this answer at stackoverflow. Branches allow a project to move on while a stable version of the sources is kept. This is mostly for safety and to "freeze" the state of a project in a "stable" state, where only bug fixes are made. New features are made only in a development or experimental branch. Then you "simply" switch between the development and production branches, according to the current work that need to be done (do not get confused!). Indeed, when you want to make it funnier, you can create many branches, give them obscure names and get changes from one withing another and so... But branches are another hellish topic, i.e. advanced uses of git that I do not need here (e.g. this post). Our own sub-project may not need branches... But the original project does have a few, so we need to deal with them a little bit at least. In our case, the branch named revert-1350-Development looks enough dubious to me that I will not even go and try to get more information about it... I will assume the first one is the only useful one. Surprisingly, there is no "stable" or "production" branch for this project! If you need to deal with local branches, and not-yet committed changes, then you need to read about more gory details (drowning a spoon, oh no, syncing a fork). Or check this useful, short but comprehensive dynamic cheat cheat. 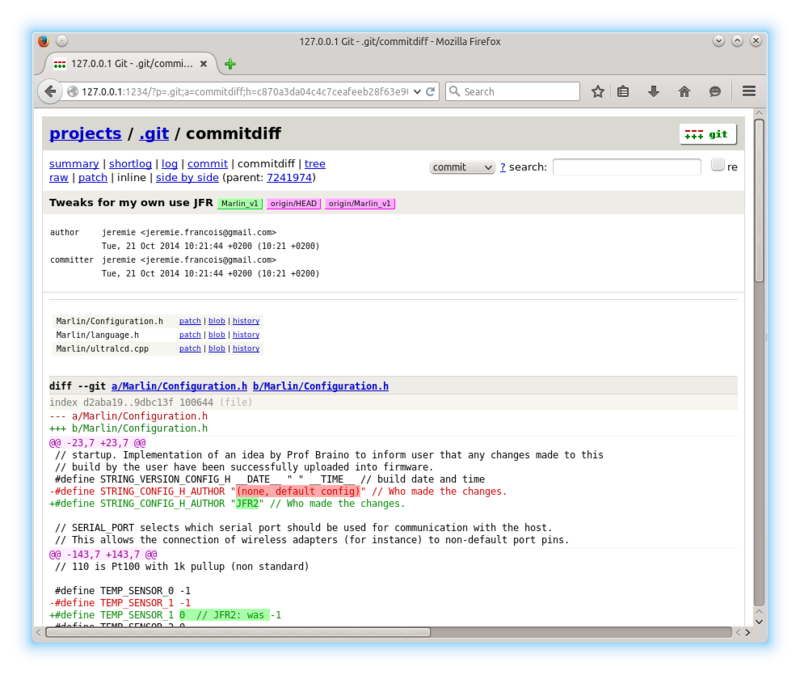 Note: git comes with a very useful interactive tool based on a local web server (default is to use the light lighttpd that you may have to apt-get install lighttpd first - but it runs also also with apache, see the git reference here). 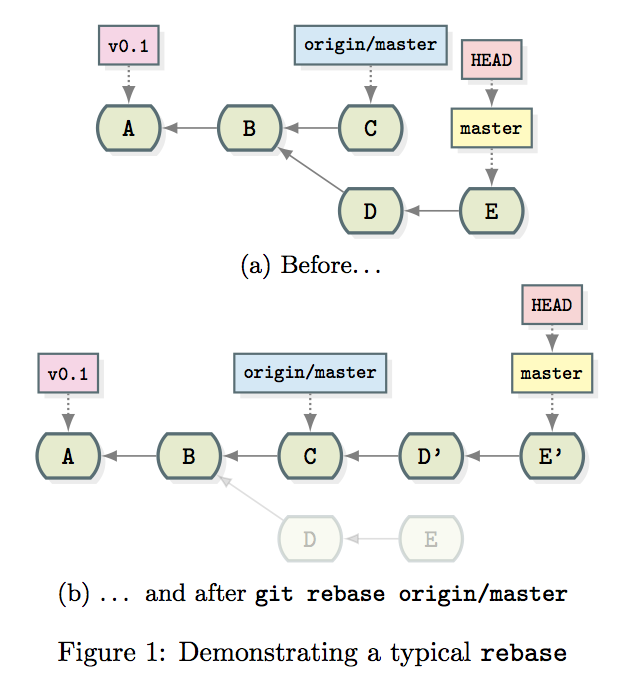 Just move to your repository and type git instaweb. It will launch a web navigator, that lets you parse and compare branches and history in depth. git instaweb is a very nice GUI to parse an existing repository! Pull requests, aka submitting a change to the original authors... at last! Everyone benefits from a project that is maintained in a good shape. This is also why there are often separate "stable" (even sometimes obsolete), and development branches. The stable branch ought to be fully functional, with only bug fixes pushed into it. Also, make sure your new feature or bug fix is useful to others, and that it neither breaks something far far away in the original code source... or they will hate you alike. So enough joking... the deal is to tell the maintainer that your branch has something new, that they can grab and integrate it in their own (upstream) repository. This is mostly why your changes should be minimal: be as close as possible to their latest versions before you submit your so-called pull request. Strangely, the pull request must be made from a web browser, not from the console. Actually here the official documentation is linear and easy to follow. May be this is because it moves a bit away from the overly complex guts of git into something much easier now (and I really am a console guy though!). So the next steps is to ask the maintainers to integrate your change. And this is made straightforward in the official documentation this time. > Still, feel free to ask when you want me to explain it further in this post ! I just hope this post could help a few developers to contribute to open source projects. A sierpinsky triangle... made with git by BooK ! While I did minor modifications to my pull request to match expectations, the master evolved. Which produced conflicts in a few files. So I had to tackle merging the two sets of changes. 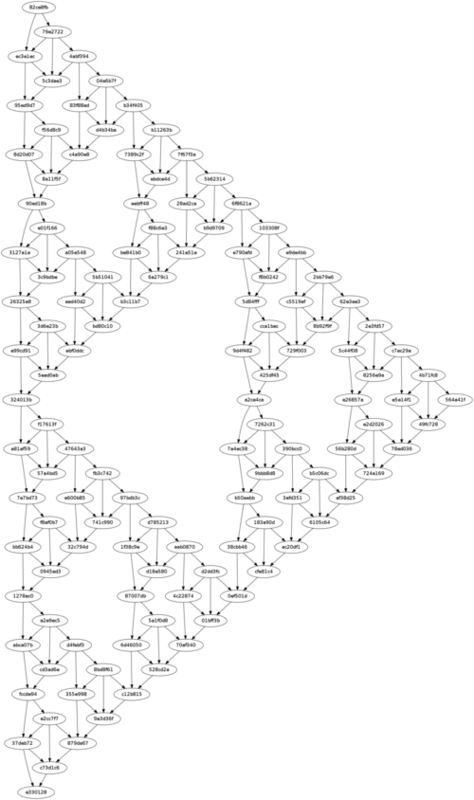 Note that the file shown in the middle is the common ancestor to "theirs" and "ours". There is no need to change it as it is only included for reference and to better understand/solve the conflicts. So the deal here is to take bits from "theirs" (right file) and insert them in "ours", while not overriding our own new features. Now check the status of our version with git push. In my case, I suspect that my editor removed spurious white spaces, and it resulted in 174 commits, but in fact it was the files and modifications that got added by the upstream into my own repository -- no harm! git checkout -b for_RMUD # weird name eh? but I know exactly what it means! Here I created a new branch with a nice name (!) that will hold variations that are specific to my own needs, but that I do not want to commit to upstream. As shown, creating a branch sets you in by the way. When we get another conflict, we solve it again with git mergetool, as previously. Just clone the source code from https://github.com/MarlinFirmware/Marlin.git , then open ultralcd.cpp and to the function named lcd_prepare_menu() for example. This just adds a command named thanks to MSG_DISABLE_STEPPERS (check the translation strings in the project files! ), and that inserts the M84 command in the current buffer that is being processed. But the existing state of Marlin will not allow more than one command. 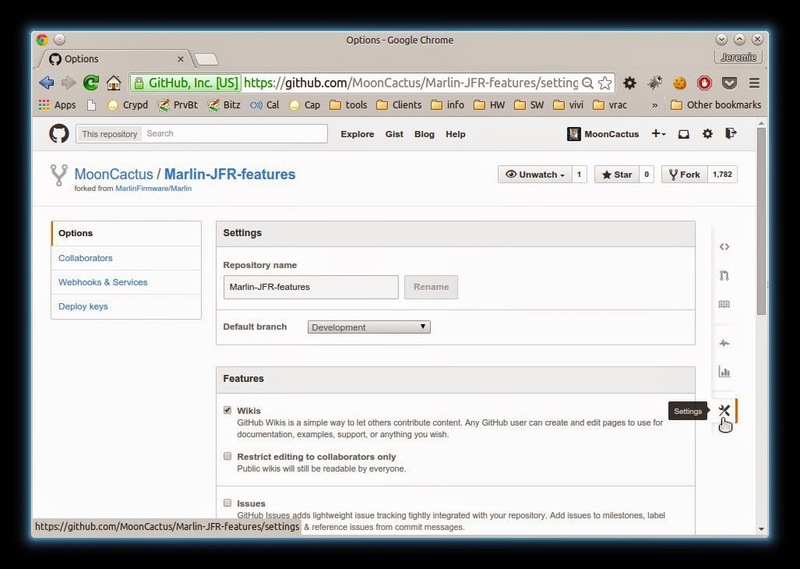 Improved menu entries in Marlin with multiple g-code commands. This is very useful to calibrate the bed of my Delta printer. Without the patch to Marlin, I had to save these to separate files on each of the SD cards I could use with the printer, or to send them over USB to the printer from a PC, which I do not like at all. Another solution would have been to write a dedicated command in ultralcd.c and attach it to a menu entry. What about Printrun custom buttons? Multi line commands support alike! By the way, I used Pronterface a lot during the initial calibration of my printer. It has very convenient "custom buttons" but they suffer from the same limitation: you can only give them one g-code command! In fact, copy/pasting a sequence of multiline commands does work, until you restart restart Pronterface since it then keeps only the first line. This was quite annoying because of the lng sequence I used to calibrate my printer. This way, custom buttons may hold "multiline" commands, by separating them with a "|" (pipe) in place of a newline "\n". This tricks lets Pronterface reload the buttons with no additional fix to its source code. update: oops. The author just told me I could instead have used the "macro" option, and then have added a custom button that plays the macro. This also does keep the newlines unchanged. Still, it is a bit counter-intuitive that the custom button shall be restricted to a single command imho. This is a modified Pronterface that allows multiline gcode commands in the custom buttons!